Forenji is an Ethiopian word, in the Amharic language, which means foreigner. I arrived in Addis Ababa on Dec. 20, due to spend my entire Christmas holiday traveling to the north of the country and back before New Year’s Eve – Dec. 31. At Hotel Taitu, located in Addis’ historic Piazza district, I checked in and hit the town. The cold weather was quite a shock, but it was early Friday morning and I knew it would warm up in the afternoon. I shedded my jacket and walked around Piazza looking for a café to try my first traditional Ethiopian coffee. I sipped the strongest cup of Harar I’ve ever tried in my life, and knew that it would provide me with enough energy to keep me going throughout the day, despite my exhaustion from lack of sleep at Nairobi’s airport the previous night. My first day in Addis was spent acquainting myself with the city and all its intricacies. From Piazza I made my way down to Bole, past the Derg regime monument, and back up through Arat Kilo, a hip district I became quite fond of while I was there. 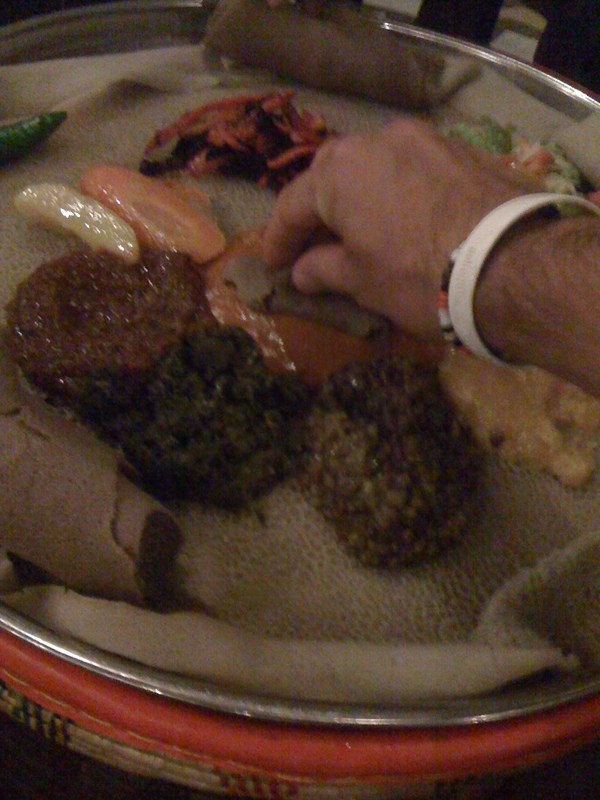 The second day I was taxied around the city by a friend who took me out for a traditional Ethiopian meal, consisting of injera and mounds of fasting and non-fasting foods (vegetable and meat). The restaurant was called Dashen and is located by the old Ambassador Theatre in central Addis, near the Sheraton Hotel and down the road from the Prime Minister’s lavish residence. Coffee, food and beautiful women, is the only way I can describe Ethiopia. On Sunday, I caught a bus up to Dessie, stopping for a macchiato break, where I tasted the most exquisite shot of coffee with mousse and some sort of delicious cocoa flavour. From there, I caught a mini-bus to Woldiya where I was stranded for a night, being unable to catch a connecting bus to Lalibela, my destination. In the morning I was up before dawn to catch a public mini-bus into the mountains which surround one of Orthodox Christianity’s most holy sites: the rock-hewn churches of Lalibela. It was a bitterly cold morning and the bus ride was excruciatingly long. A journey of 60-some-odd kilometres took almost eight hours due to the lack of paved roads and mountainous terrain. Along the dirt road, somewhere in the mountains, children would run out of the bushes and leave their daily chores behind to wave at the passing vehicle. It must be a daily ritual, as visitors only pass-by and never actually stop and stay. I waved back. The rural children were dressed in tattered clothing and clutched their school notebooks as if they were on the way home from class. Sadly this wasn’t the case. 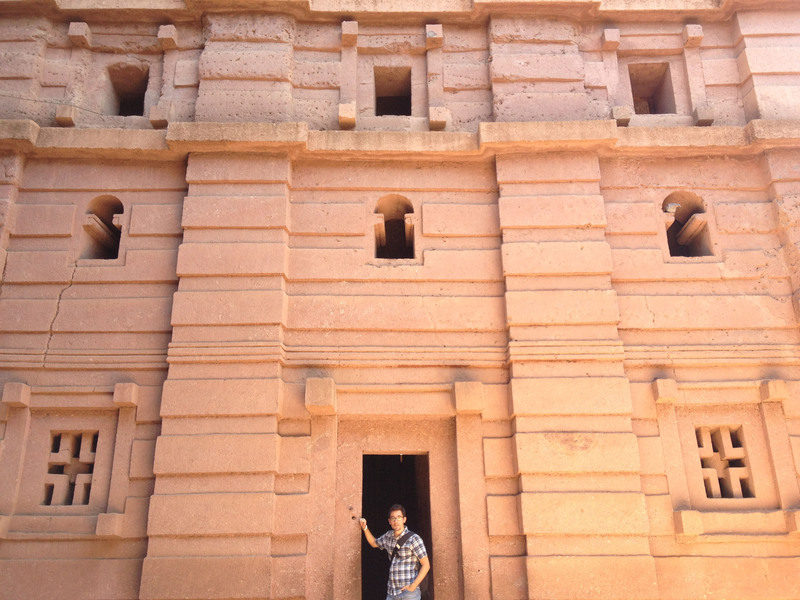 Lalibela is a majestic town tucked away up in the mountain. When my bus finally arrived I hiked uphill three kilometres into town to find Hotel Asheton, the place where I would spend Christmas Dec. 23-25. Immediately, I ditched my gear in the room and headed to the entrance gate to finally see the churches cut from the rocky mountainside. I payed the astronomical $50USD fee (reminiscent of Jordan’s Petra) and made my way inside. 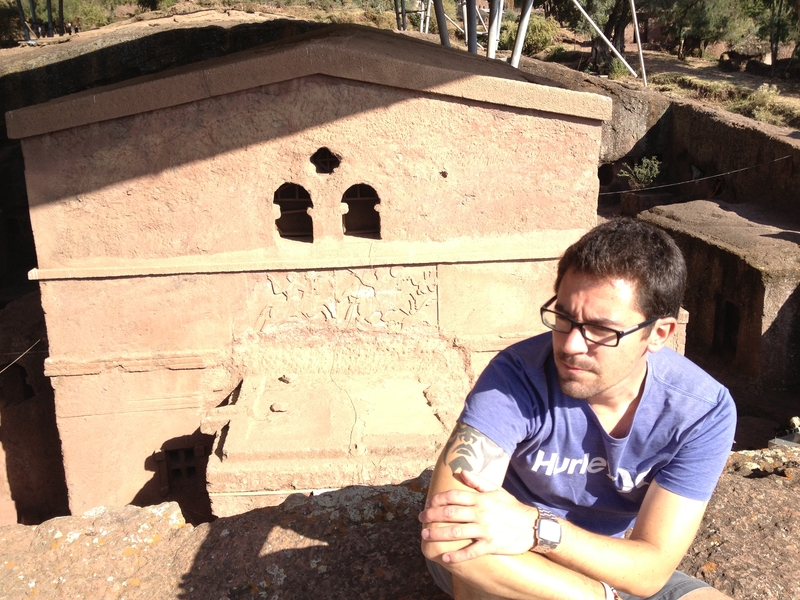 Upon laying eyes on the first church, I was again reminded of Petra. I overheard a tour guide telling his group that these monolithic rock churches are the first instance of top down architecture, meaning the churches were carved down into the rock instead of constructed upward as all buildings are built. I walked around taking it all in and ducked through a few ancient, narrow, tunnels which reminded me of Jerusalem’s city of David. I spent two days visiting the churches, making it as worthwhile as possible. On Christmas Eve I visited Torpedo, a traditional Ethiopian venue with drinks and dancing. Tej is a type of honey wine I wasn’t too fond of, so I switched to St. George, the nice, crisp lager beer I was all too familiar with. Dancing in Ethiopia is another thing altogether. They shake their shoulders so violently it looks painful. When I gave it a try I realized my shoulder-eye coordination wasn’t there at all. Back on the bus Christmas morning, I headed to Bahir Dar, a city nestled on the shores of Lake Tana, the source of the Blue Nile River. The macchiatos at Wude Café in Bahir Dar exceeded the taste of those I drank at the roadside restaurant a few days before, so I ordered a few. Hopped up on caffeine, I grabbed a tuk-tuk (bijaj) and made my way to Blue Nile falls outside of the city. I arrived at the falls covered in dust from the hour-long drive along a dirt road in the back of an uncovered tuk-tuk. As I stepped out into the street and dusted myself off, I descended down steep rocks to the Portugese bridge and into another world. Kids selling scarfs and sodas followed me around trying in vain to get me to buy something. The landscape around Blue Nile falls, like all over northern Ethiopia, is breathtaking. Due to a major hydroelectric dam being constructed a few miles away, the water flow was extremely low. Nothing on par with Victoria Falls in Zambia-Zimbabwe, that I can assure you. But it had its own beauty. To reach the final set of falls, I had to cross a long suspension bridge over the river. I kept my eyes in front of me and didn’t look down, as the drop was definitely vertigo inducing. Gondar was next on the itinerary. A whirlwind tour of the city’s castles was on the cards as I was ferried from one to the other in one afternoon. These 16th Century castles and churches were built during the height of the Ethiopian empire, a time when kings ruled everyone in the land. Of course the Abyssinian monarchy finally fell in 1974, followed by the assassination of Emperor Haile Selassie the following year. 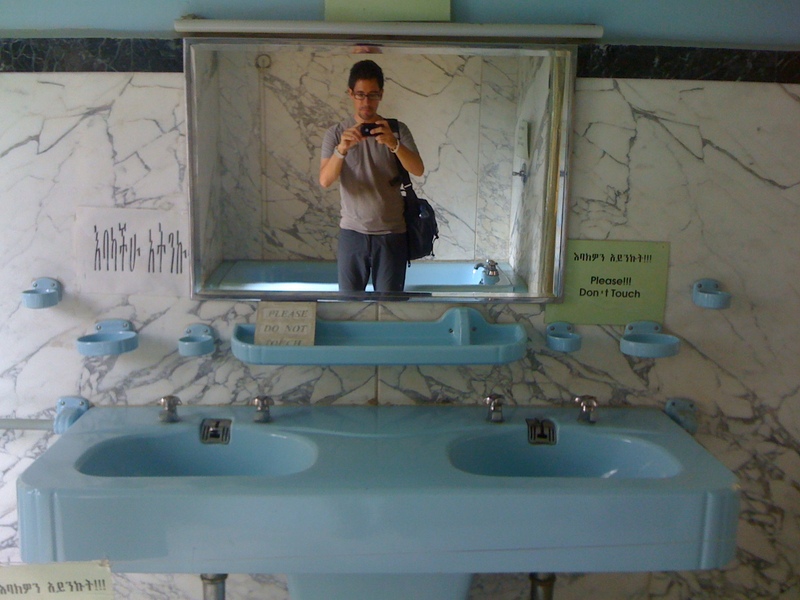 Inside the ‘Lion of Judah’ Emperor Haile Selassie’s palatial bathroom. A long, but relatively comfortable, 13-hour bus ride brought me back to Addis for one last weekend in the seat of power, trying to reconnect with a lost time. I spent a day in Arat Kilo, visiting the National Museum for a glimpse of Lucy’s skeletal remains, and the Ethnographic Museum to see Selassie’s former palace and laugh at his bed, which looked like it was built for a Hobbit. He was an extremely short man, which is quite comical since his stature in world history is so large. My last stop on this journey was Meskel Square, Addis’ most notorious public plaza where a monument stands commemorating those Ethiopians killed during the 1970 Derg regime, or “Red Terror” as locals refer to the time ruled by Soviet-backed communists. After hearing from friends how the Red Terror Martyrs Memorial Museum was too difficult for them to visit, I decided to see it for myself and learn a bit more about this dark period of Ethiopian history. Inside, I found it quite bland with photographs and random items used by the regime to disseminate propaganda. The most awful thing I saw was in a dark corner: a torture device with a mannequin strapped to it which left nothing to the imagination. I felt horrified knowing this was how they dealt with those held captive. Images of Iraq’s Abu Ghraib prison flashed through my mind. Overall, I thoroughly enjoyed my time in Ethiopia. It’s one of the most interesting countries I’ve visited in awhile and I look forward to returning soon, so I can visit “The City of Saints” Harar and make my way south to Omo Valley. All in due time.